I was born in Poland where my father was a respected Rabbi, and my mother was a pious woman who spoke Hebrew as well as Polish fluently. After some years at a Talmudic school, where I had studied many other subjects after class, I returned home. I did not, however, intend staying at home because my opinions and way of thinking had changed. I had no inner peace any more. I used to be very interested in the Talmud and other Jewish classical writings, meditating on them, but then had become engrossed in the Old Testament prophecies. 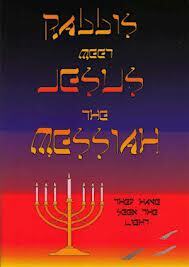 Again I had studied the Hagada (Jewish traditions) and began to doubt. Perhaps the writers of the Talmud had made a big mistake by condemning the greatest man of their nation to death; maybe they had had some reason for inventing the most fantastic tales about His birth. The more I studied the Hagada, the clearer my insight became till at last the exalted though terrifying thought occurred to me that He is indeed the promised Messiah. I compared the explanations of the Talmud with the Old Testament prophecies and saw that all foretold by the holy prophets had from beginning to end been fulfilled in the life of Jesus. From that time I did not have any peace of mind but somehow lacked the courage to reveal the secret of my heart to anybody, knowing that my voice would be like that of a preacher in the desert. I was still young and thus kept everything secret for a while. However, one day I heard Jewish people telling nasty stories about the Saviour and I became so agitated that I could hardly control myself. I went home and my mother could tell by my face that something unpleasant must have happened. I did not want to tell her but when she insisted, I revealed to her what had been going on in my mind. In anger and consternation she cried out: "Do you really know what you are saying? The devil has taken possession of you to draw you away from the Lord. What shall be your fate on the day of judgment?" But when she noticed that she would get nowhere with hard words, she pleaded with me to get rid quickly of those ideas while there was still time. My reply was that up to that day I had never grieved her, but had always taken trouble to please her, and the way I was now causing her to worry, must be proof of my conviction of the truth. Therefore I could not change my way of thinking. Before I had finished speaking, my father entered the room and we kept quiet. During the night my parents awoke and started to talk about me. After that I was carefully watched by them and when they saw me reading a book other than the Talmud, it was burned. This went on for a year. One day my father spoke very severely to me. I told him that no threats or curses would ever change my mind. This was the first of many long discussions which made life very unpleasant. Considered to be such a great sinner, I was regarded as being the cause of every affliction and grief. Eventually I ran away from home to my uncle in Lodz. He was a rich man, had no children and was pleased to have me stay with him; but after the receipt of a letter from my father telling him about me, he changed so much that I had to leave him. Then friends invited me to stay with them. I earned my keep by teaching while I continued studying. At last I passed my examination and became a Rabbi. A friend invited me to a Baptist Church where a missionary was to speak. We went and heard him address a large gathering in words full of Spirit and Truth. Afterwards when I confirmed the truth of the missionary's words there was an uproar. The other Jewish hearers cursed me and wanted to tear me to pieces so that I had to hide myself. The next day I left Lodz and travelled to Vilna where I continued my studies. My parents had, however, given me a wife when I was still very young, and so I was obliged to accept the office of a Rabbi in a small Polish town. It was the beginning of a difficult time for me. On the Sabbath before the Passover I had to speak in a synagogue in Chomez. In my pocket was a New Testament and a Hebrew book of the same size. By mistake I took out the New Testament and dropped it. It was picked up by somebody near me, and when he wanted to hand it to me he saw that it was a New Testament. He screamed as if a snake had bitten him, and told the congregation that I, their Rabbi, possessed a New Testament. He added that not only I but they also would be punished for my sin. This made me tell them that I was going to resign from my office as their Rabbi, which I did a few days later. What I had to suffer at that time! My mother died of worry and my father decided not to see me again. Afterwards I was appointed as a religious instructor and teacher of Hebrew by the Jewish congregation in Warsaw, a vocation I practised for nine years. Then H K, a former teacher, was appointed inspector of religious instructors. One day he and my colleagues were gathered in my classroom for a discussion when the sorry plight of the Russian Jews cropped up. We considered ways to improve their position. I tried to convince them that their propositions would lead to nothing and then openly said that the position of us Jews, would not improve before we were prepared to acknowledge the awful mistake our ancestors had made, and to recognise Jesus Christ as our Messiah who had shed His blood on Golgotha to liberate us from our sins. This started a discussion but not an angry one because all my colleagues present were free thinkers and the inspector himself an avowed atheist. He had hated me for a long time and now seized the opportunity to report me to the Board of the Jewish congregation. When I attended a Sunday evening service of the Warsaw Mission two Jewish young men entered the hall. Afterwards they went to the Jewish congregation to tell them that I was a baptized Jew and they had seen me kneel with others in Church. The Board met and decided to dismiss me without any remuneration or compensation, and without the opportunity of defending myself. It took a long time before any compensation was promised to me. When I appeared before the Board to receive the money, I asked them: "Why was I dismissed before any, investigation had been made?" One of the Board members answered: "If we had asked you to come, you would not have told the truth. Now we do not believe you any longer in the matter, because two witnesses have, according to Jewish law, sworn before a Rabbi to the truth of their statement, and you have forfeited your right to be believed." To this I replied: "Gentlemen, you are mistaken; I am always ready to speak the truth." "Did you pray with the Christians and kneel with them? Were you baptized some time ago?" I answered calmly: "I have not yet been baptized but hope that it will happen soon." That was enough; I was not allowed to say another word; and was bombarded with abusive language and ridicule. But I remained calm and respectful. During the ensuing pause one of the men jumped up, turned to me and screamed: "You trouble-maker, how dare you utter those religious opinions so calmly and defiantly in our presence? We know that as former Rabbi you will attack us verbally and in writing and slander Jewry, you wicked traitor." One of the men ran to me, his hand raised ready to hit me, and shouting: "Yes, it would be best to kill him." My reply was: "Gentlemen, I am in your power and you are free to do it. I do not hate you; no, on the contrary, I love you. But I sincerely regret that you are so stubborn, and do not want to admit that much evil has happened to us because we had slandered and crucified our Redeemer." Now the excitement flared up once more and I was not allowed to say another word. One of them, however, asked me: "If the congregation should take you back and pay you a good salary on condition that you promise not to contact the missionaries again, would you be willing to do it?" To this proposal I answered: "I shall never sell my soul for money." So the public connection with my countrymen ended and with it my source of income. P.D. Weiss was exceptionally gifted and his knowledge of the Talmud almost unparalleled. He was a well known and highly esteemed teacher of Hebrew and of the Jewish religion and he began to study the Christian religion and to attend the services at the Warsaw Mission. Immediately after his baptism he began to witness boldly for his Messiah. His conversion caused much excitement and temporary opposition to the Mission and its leaders, and he was of course ostracized by his Jewish brethren. Afterwards he was called as a co-worker by the Warsaw Mission and proved himself to be a valuable one! When he discussed religious subjects with Jews in the city or on his missionary travels, his relevant quotations from the Talmud caused great amazement. The Jews often regretted that a man who had been so respected by them, had become an "apostate." This respect continued as was evident at the funeral of this faithful witness of Christ when more than 150 persons, mainly Jews attended to pay their last respects to the deceased.